*HOT* Vera Bradley One-Day Sale! One Day Deal! 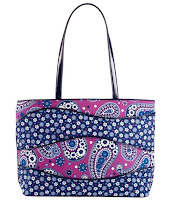 Pick up the Vera Bradley Making Waves Tote for just $29.99 (reg. $68) or the Making Waves Crossbody for just $24.99 (reg. $55). Plus -- FREE Shipping on orders of $75 or more. Offer Valid on Sunday, June 26th!